The last few months have been filled with discussion, criticism and – yes, believe it or not – even praise for Microsoft’s newest operating system, Windows 8. Not everyone is happy with the direction that Microsoft has taken with the platform, but it seems that everyone has an opinion on it. Perhaps the biggest single criticism – although arguably the least significant, in the grand scheme of things – has been the absence of the Start button, but beyond that, there remain many issues with the OS that users have found less than appealing. Microsoft has promised that it is listening closely to user feedback on Windows 8, and that it will respond appropriately to make improvements to the OS in its next major update. We’ve known for some time that that update is on the way – part of the “Blue” wave of updates that will see significant improvements across Windows 8, Windows Phone and Windows Server, along with “Gemini” updates for the Office suite. Today, Microsoft revealed its first official look at what it’s got in store for Windows 8.1, ahead of the release of a preview version at its BUILD conference next month. 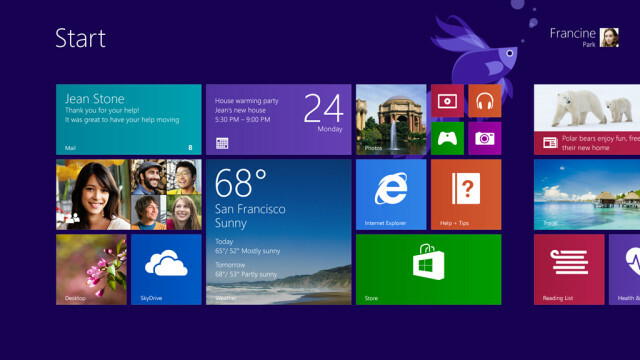 Take a look at the image above, and you’ll notice a range of changes over the Start screen that debuted in Windows 8. The biggest changes are ones that we’ve been discussing for some time – improved customization options for the background and, perhaps most excitingly, more flexible tile sizing options. Of note not is just the very small tiles – similar to those introduced in Windows Phone 8 – but also the option of giant, square tiles; in this case, it’s used to showcase a beautiful Weather tile with lots of useful information packed in. 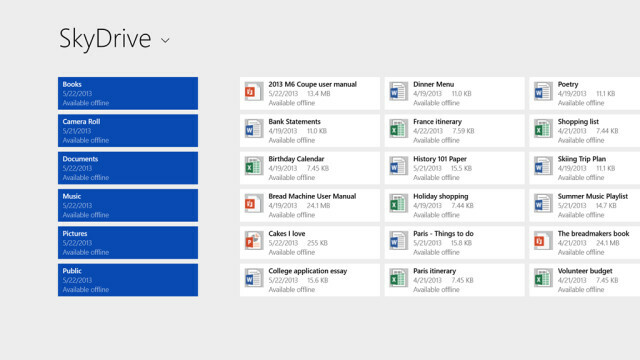 Customizing tiles is said to be easier than ever, with the ability to change settings for multiple tiles at once. You’ll have the option to set your Start screen background to the same image as your Desktop wallpaper, and newly installed apps will be automatically marked as “new.” Finding apps on the Start screen is easier through new filtering options, enabling you to sort apps by name, date, most used or by category. You’ll also be able to use your lock screen to turn your device into a “picture frame” by using it to run a slide show of your favorite photos – a response to the way that many users have chosen to showcase their lock screen to show a cherished photo, such as those of their families. And yes, of course, the Start button is back. While Windows 8 is designed as a “touch-first” operating system, Windows 8.1 nonetheless makes concessions for those users who still use the more ‘traditional’ input methods of keyboard and mouse. It’s these users who’ll likely be happiest about the return of the Start button. When you’re on the Desktop, the Start button always appears on the Taskbar. If you’re in a Modern/Metro app, the Start button won’t be permanently visible at the bottom left, but will appear when you move your mouse to that corner of the display, in much the same way that the current Start ‘tip’ image appears in Windows 8. Users can choose to customise how the ‘hot corners’ behave, and can also opt to boot the system into different screens. Yes, that does mean that you can boot directly to your Desktop if you want – or if you prefer, you can boot to the ‘All Apps’ view on your Start screen, for example. As we’ve previously reported, Windows 8.1 brings a more comprehensive search experience with deeper Bing integration. As Microsoft explains: “The Search charm will provide global search results powered by Bing in a rich, simple-to-read, aggregated view of many content sources” – which will include not only local apps, files and SkyDrive content, but also the wider web. You’ll also be able to take advantage of “quick actions” from search, such as playing songs or videos. 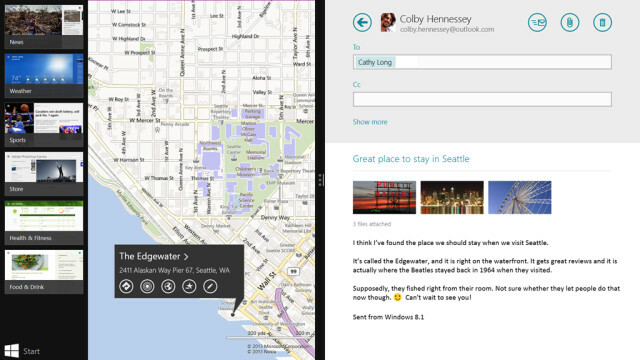 Windows 8.1 brings improvements to the “snap view,” which allows Modern/Metro apps to be displayed alongside each other. There will be more ways to view multiple apps concurrently, with the option to resize apps as desired, and have up to three apps on each screen if you have multiple displays connected. Users can even have different apps running on each display, as well as the Start screen open on an additional display. Users can also have two instances of the same app displayed side-by-side, such as two Internet Explorer windows, in snap view. The Windows Store has also received a range of improvements, with more detailed lists of free apps, new releases and highlights on the home page. Microsoft says that the app listing is “more descriptive and information and includes an area for related apps to help with app discovery” – which sounds a lot like a similar feature in the Windows Phone Store. Apps will no longer require manual update approval, instead automatically updating in the background as soon as they’re available. Windows 8.1 brings more comprehensive SkyDrive integration, with an increased focus on the cloud and web across the OS as a whole. Logging into a Windows 8.1 device with a Microsoft account will automatically – “magically,” says Microsoft – personalize it with all of a user’s settings and apps. Microsoft has made improvements to the experience of browsing the web in its updated OS with an improved version of its integrated browser. In Internet Explorer 11, Microsoft promises improved touch performance, faster page load times and various other features, such as being able to customize the UI to always display the address bar, and to be able to open as many tabs as you want. Users can also access their open tabs in sync across multiple Windows 8.1 devices. Microsoft has promised an updated PC settings center in Windows 8.1 that offers complete access to all settings without needing to access the old-school Control Panel on the Desktop. The new and improved PC Settings interface provides the ability to change things such as display resolution and power options, change the system product key, perform full Windows Update functions and join a domain. Antoine Leblond, corporate vice president for Windows Program Management, explained in a blog post today that “Windows 8 has been a bold, necessary move towards mobility for the PC industry, pushing ourselves and our industry ahead with a touch-first approach that is redefining the PC as we know it.” Microsoft’s problem so far appears to have been that its users haven’t been ready – or willing – to accept that kind of change, and the language that the company has used in recent weeks to define its approach to the feedback it’s received has been telling. Even so, Leblond added: “Our commitment to that vision – and to always improving – remains the same as we stay the course of the evolution of Windows with Windows 8.1. We’ve been watching, we’ve been listening; Windows 8.1 will continue to build on what you love, bringing the latest advancements in hardware, apps, cloud services and the OS to enable a unique experience in everything you do.” So, Microsoft is listening to your feedback – but don’t expect them to back down completely and turn back the clock. 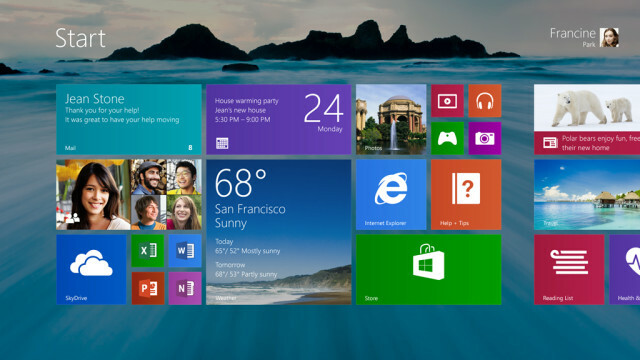 The company says that these are “just some of the updates” that it’s got in store for Windows 8.1, and that there’s plenty more details still to be revealed in the weeks ahead, and at its BUILD developer conference in late June, where a preview version will be made publicly available. Microsoft will also be sharing more details on how Windows 8.1 “will include big bets for business in areas such as management and security” at its TechEd North America event next week.